A solo acoustic performance for traditional lovers of piedmont and delta blues with lots of slide guitar and a song on a "one string" diddley bow. The Blues is a Very Old Style of Music. shows when he was a young boy in the 1880's. sassy sounds of Son House playing delta blues. him over the years. John passed away in 2002.
homemade "one string" diddley bow! Hits the blue nail square on the head! 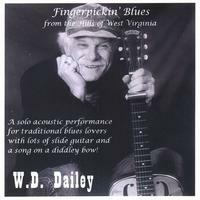 Traditional Folk/Blues is alive and WELL thanks to WD Dailey. Keep pluckin' and have fun doin' it! Sounds that way to me at the least. From an Old School Blues afficiando. Un trés bon interprete et un fabuleux virtuose ! Buy it, it's great ! Loved the Slide guitar,and the song and lesson on the Diddley Bow.Love the style of the acoustic Blues. The rendition of the Robert Johnson songs awesome. A great traditional Blues CD.Recommend "Go buy it"
Fantastic all the artists who are donating to The Red Cross. I enjoyed listening and learning how to play slide blues. I found the cd not only entertaining but informative. I am a new dopro-slide blues guitarist. This cd, although way beyond my ability, provided me ideas and style that I can begin to integrate in my style as I develop. I am also a born West Virginian-Petersburg in Grant County, now living in the beautiful state of Alaska.